The picture “Breakfast of the blind” Pablo Picasso wrote in 1903, when he was only 22 years old. This picture was created in the early period of creativity of the Spanish artist. The period from 1901 to 1905, the year of creativity of the Spanish genius, was called by critics “blue”, because at that time in the works of Picasso blue color prevailed, which he called “the color of all colors”. In the works of the “blue period” most often depicts the poor, the poor, the lonely and the disadvantaged people. This topic was very popular among artists living and creating in Spain. The painting “Breakfast of the Blind” is a characteristic work for early Picasso, where in the center there is always a person surrounded by various objects and internal experiences. With the help of subtle details, the artist tries to convey to the viewer melancholic, and in some places tragic emotions. The main focus of his work is “Breakfast of the Blind”, which is focused on the blind man depicted in blue colors, who is trying to find with his right hand a bright brown jug of wine symbolizing Christianity. In his left hand he has a small piece of bread, and on the table is an empty bowl. A lean, stretched body, long sensitive fingers, a poor table fully convey helplessness, hopelessness and suffering. The tragedy of the picture aggravates the eyes of a man instead of which two gray depressions are depicted. The picture makes the viewer feel that helplessness and doom of a blind person who lives in poverty and complete solitude. 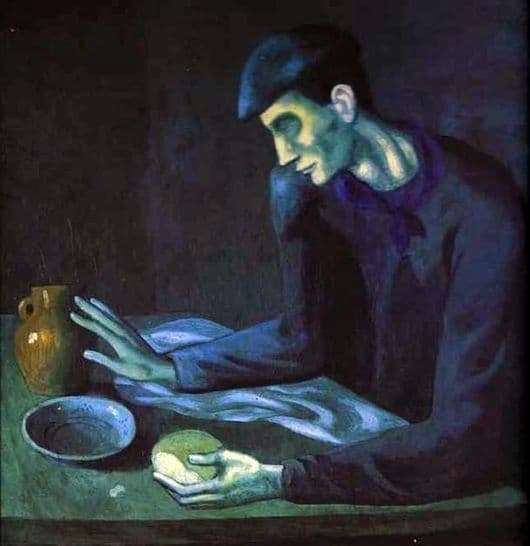 Writing such a sad picture, the artist unconditionally inspired his poor life in Barcelona, ​​so in this dull image of a blind and poor person the artist saw himself and tried to convey his own emotions and experiences, emphasizes such deep feelings blue cold color.